Congratulations to the teams at Waldorf Astoria, and Metropolis - Phase 1 which both recently achieved LEED Certification! LEED, or Leadership in Energy and Environmental Design, is the most widely used green building rating system in the world. LEED provides a framework to create healthy, highly efficient and cost-saving green buildings and is a globally recognized symbol of sustainability achievement. LEED buildings save energy, water and resources, while generating less waste and supporting human health. LEED buildings attract tenants, cost less to operate and boost employee productivity and retention. The Waldorf Astoria hotel in Beverly Hills earned LEED Gold certification at the end of 2017. The hotel has all the bells and whistles of a green building from energy efficient lighting to low-VOC materials to incredible views of Santa Monica and Hollywood, but an additional centerpiece of the sustainability program at Waldorf which Pan-Pacific is proud of is a water treatment system which collects gray water from the showers and lavatories in the guestrooms, treats it, and uses the water for irrigation. This gray water system is one of the largest and among the first in LA County. 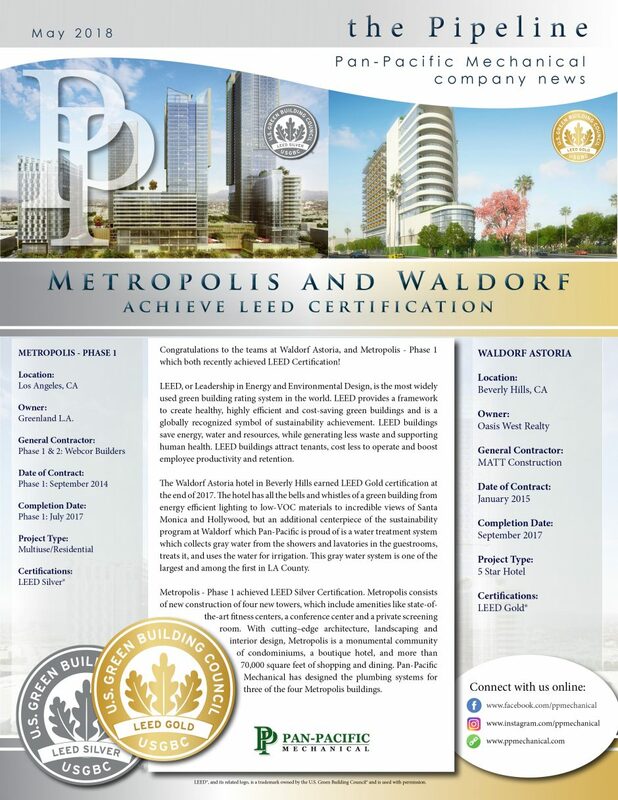 Metropolis - Phase 1 achieved LEED Silver Certification. Metropolis consists of new construction of four new towers, which include amenities like state-of-the-art fitness centers, a conference center and a private screening room. With cutting–edge architecture, landscaping and interior design, Metropolis is a monumental community of condominiums, a boutique hotel, and more than 70,000 square feet of shopping and dining. Pan-Pacific Mechanical has designed the plumbing systems for three of the four Metropolis buildings.